The Val d’Orcia (or Orcia Valley) is a popular holiday destination, and it’s not difficult to see why. This unspoilt region, named after the river that flows through it, is a natural oasis. Dotted with quaint hamlets, villages and monasteries, this distinctive countryside has, unsurprisingly, been named a UNESCO World Heritage Site. In the heart of Bagno Vignoni, you will find a rectangular area of water. No, the village doesn’t suffer from constant flooding; it is actually home to a natural hot spring! The hot spring created a pool in the village square, which is now 49 metres long and 29 metres wide. Hot springs bubble up from the bottom, resulting in a constant water temperature of around 50°C. Needless to say, this is not your normal village square! The healing properties of this water were first discovered by the Etruscans, and later the Romans would use this thermal bath for health benefits and of course, relaxation! During the middle ages, the thermal spring was frequented by pilgrims, who would come across Bagno Vignoni via the ancient Francigena pilgrim route. The spring became so popular, that many famous historical figures came to use it too. Pope Pius II, Catherine of Siena and Lorenzo the Magnificent, to name but a few! As well as the thermal spring itself, another distinctive quality of this village is that is has remained largely unchanged. The structure has stayed more or less the same, despite various instances of war and destruction. Although a great number of people frequently bathed in this hot spring in the past, unfortunately it is now no longer in use. 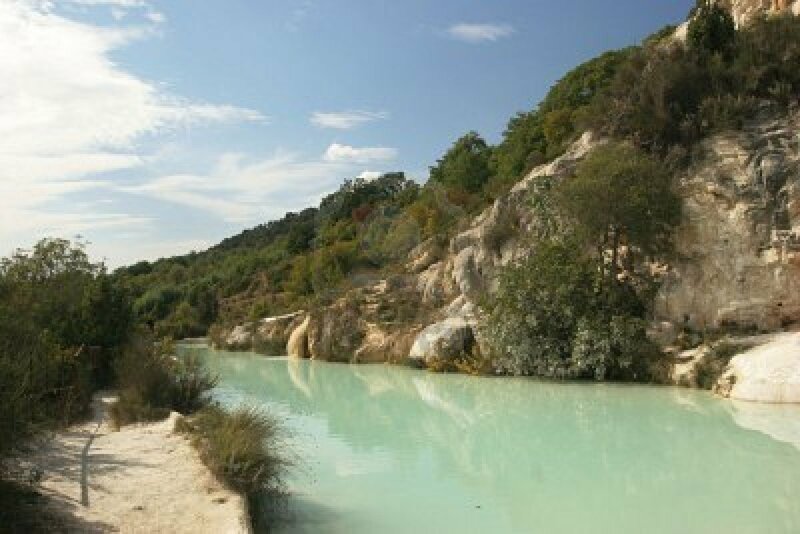 There are several thermal baths in Bagno Vignoni that you can use however, including several modern spas in the vicinity which offer relaxing and therapeutic treatments, as well as the Parco dei Mulini which is a nearby hot spring offering natural, thermal waters that you can bathe in for as long as you like. And the best part? It’s completely free! If you fancy staying in a beautiful Tuscan country villa and exploring the wonderful Orcia Valley region, including the extraordinary hamlet of Bagno Vignoni, then we have plenty of options for you, including beautiful Val d’Orcia villas and rustic farmhouses. Our properties are located in stunning surroundings and many have a swimming pool too. So choose your favourite Val d’Orcia villa rental now, and get ready to discover one of the most popular and beautiful holiday destinations in Tuscany!